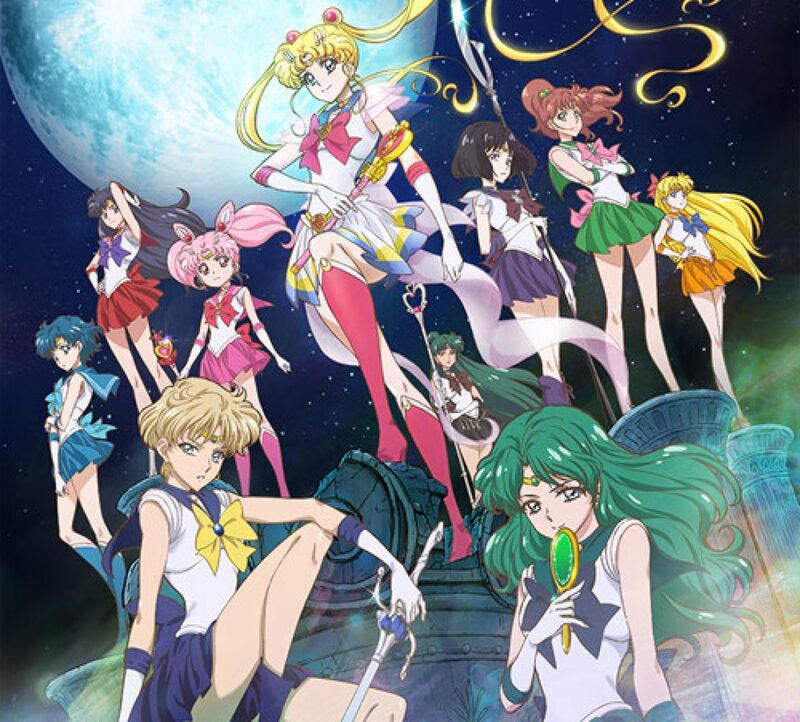 Sailor Moon Crystal Episode 3 Review | The Crystal Chronicles! This episode has a lot of differences from the original; in fact, even the senshi this episode revolved around is very different from the original character and will likely stay consistently different from the one we’re used to from the original. Of course, I’m talking about Rei who, while I was certainly in shock over the way she was depicted, I certainly didn’t dislike it. One way Rei was changed was who she chose as companions. Unlike what she had in the original series, Rei’s only companions were her crows and a little girl, Mii, who would hang out at the shrine while waiting for the bus. 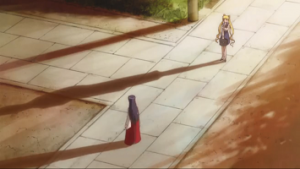 Aside from that, Rei is alone. We can see this from how Mii’s mother and the mother’s friends were uncomfortable around Rei because of her ability to sense supernatural things. The women were ready to blame Rei for Mii’s disappearance, due to this ability. In the original, Rei’s grandfather was the one blamed, but with this change, the distance Rei has from other people is a lot more obvious. Another difference, the main difference with Rei in this version, was her attitude. Most of my friends who watched Sailor Moon with me when we were young loved Rei because of her retorts and her stubbornness. I remembering liking Rei for the same reasons, of course, but also because of her intuition. In this version, Rei is still very spiritual, but her responses are not snarky. I can imagine a lot of people being disappointed about this. I, however, like it because with the way the story is being told in this series, Rei and Usagi barking at each other for several minutes would detract from the themes. However, she stands her ground in this version too, telling Mii’s mother what she can and can’t do with her powers. 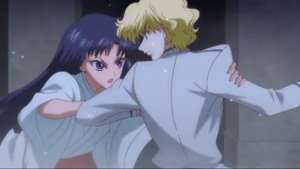 While she originally couldn’t understand why Usagi was fighting Jadeite, she jumps in to stop his attack, doing what she knows she can do, which also leads to another point. Something amazing that is being developed in this series is Usagi’s bond with the other senshi, especially in a shorter time. As previously mentioned, Rei prevents Jadeite from attacking Sailor Moon anymore and it gets to this point because Usagi is able to say words that reach her, that she needs to do what she is capable of to help people who aren’t. This is important to someone like Rei, who always felt isolated due to her powers. We also see the scouts working together. In the original, Ami couldn’t help Usagi until the very end, but this time, in a dual transformation sequence, they were able to reunite and all the current senshi were able to use to their powers together to team up against Jadeite. Aside from friendship, another aspect continually being brought up is romance. We have Usagi obsessing over Rei, which can be taken in multiple ways. One of my friends had a theory that Usagi is naturally attracted to those she recognizes from her past since she does the same admiring, to a lesser extent, with Ami. 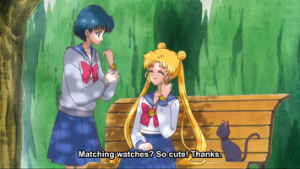 Another viable theory is that, based on relationships that are/were canon in the Sailor Moon universe, it shouldn’t be a big deal if Usagi has a crush on Rei. No matter which theory you’d prefer, sadly, Usagi and Rei probably won’t be canon because of who we know Usagi ends up with. 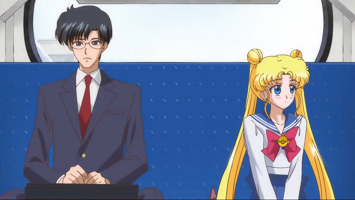 Speaking of this someone, he and Usagi have a moment on the bus where they share notes with each other. Mamoru still teases Usagi but I like that they are helping each other out, despite not fully knowing each other’s identities yet. We also get some info on Mamoru’s current identity as a student. That moment where they made eye contact was also cute because it reminds us that they are interested in each other. 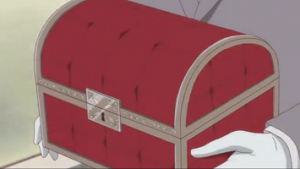 Another part I liked was Tuxedo Mask’s contribution of catching Luna when Usagi grabbed onto the bus. It showed Usagi’s strength by having her still do the harder work, while still having him do what he could to help her. Overall, despite the changes with Rei, I think the storyline is working well to bring everything to a central point. The inconsistency with the art is still distracting; the eyes were sometimes crooked. I also think the animators decided to experiment with the angles in this episode when showing Usagi confronting Jadeite from Rei’s point of view but all that did was make their arms look like noodles. The bigger disappointment, however, is the lack of Jupiter. I was expecting, with the pattern of introducing one senshi after another, that my favorite senshi would show up in the next episode. I hope the next episode will still be entertaining and bring something valuable to the series.